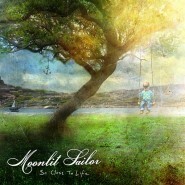 Swedish post-rock band Moon­lit Sailor released its sec­ond album (and first signed album) a few weeks ago. Moon­lit Sailor is a rel­a­tive­ly young band with young mem­bers, and while it orig­i­nal­ly fit into the gen­er­al indie genre, it grad­u­al­ly devel­oped into a post-rock band a la Explo­sions in the Sky. The album itself, So Close to Life, is a gen­er­al­ly decent album, albeit rather sim­ple, but it is marred by a few com­mon, but nonethe­less dam­ag­ing flaws. What Moon­light Sailor clear­ly does best is its over­all album plan­ning. So Close to Life starts out extreme­ly cheer­i­ly, almost obnox­ious­ly so. From there it slow­ly becomes dark­er and more pow­er­ful, cli­max­ing with the almost jar­ring accent­ed chords of the apt­ly named “A Week with­out Sun­light.” From there, the album draws back, although nev­er arriv­ing at the same lev­el of bright­ness as the open­ing track, “Sun­beams.” And while this could eas­i­ly have been a per­fect­ly sim­ple path, Moon­light Sailor choos­es the wind­ing road, pro­vid­ing tracks like “Fresh Snow,” which acts as a wel­come reprive from the album’s dark­en­ing. But while the direc­tion of the album as a whole is well planned and suf­fi­cient­ly com­pli­cat­ed, indi­vid­ual tracks are quite ele­men­tary. Even though the over­all sound is, for the most part, per­fect­ly decent, there seems to be a set lev­el of com­plex­i­ty which no sec­tion can sur­pass. Some sec­tions of tracks have nice melodies, oth­ers inter­est­ing rhythms or a more com­pli­cat­ed drum line, and still oth­ers the occa­sion­al coun­ter­melody or inter­est­ing har­mo­ny, but these are rarely com­bined in a sin­gle track. So though Moon­lit Sailor has cre­at­ed gen­er­al­ly strong post-rock with So Close to Life, occa­sion­al flaws and laps­es in cre­ativ­i­ty pre­vent it from being excel­lent. An inter­est­ing vari­ety of instru­men­tal approach­es through­out the album pro­vide a range of musi­cal expe­ri­ences through the best parts of most of the album, but all too often sec­tions of indi­vid­ual tracks fall into repet­i­tive sec­tions which, even with the small musi­cal flour­ish­es Moon­lit Sailor has adorned them with, can’t sus­tain them­selves through entire tracks or even the long sec­tions they occu­py. This also occurs across tracks, though to a less­er degree - some of the more repet­i­tive sec­tions are rec­og­niz­able sev­er­al times dur­ing the album, per­haps shift­ed a bit in one direc­tion or anoth­er. The oth­er prob­lem So Close to Life suf­fers from is a wan­ing abil­i­ty to hold the atten­tion of and excite the lis­ten­er. While this is becom­ing increas­ing­ly endem­ic to albums, it’s always a bit dis­ap­point­ing to see it mar the ends of oth­er­wise promis­ing tracks. This cer­tain­ly isn’t an issue through­out So Close to Life, as sev­er­al of the bet­ter tracks, includ­ing “Fresh Snow,” eas­i­ly draw atten­tion through­out, but when it is, we’re left wish­ing that per­haps Moon­lit Sailor could have put more of a musi­cal oomph into cer­tain tracks. As it is, a sub­stan­tial por­tion of the album’s tracks deflate through their sec­ond acts, up until the ulti­mate­ly unsat­is­fy­ing finales. So Close to Life cer­tain­ly isn’t per­fect, but there are some gen­uine­ly cre­ative sec­tions through­out the album. Most of So Close to Life starts quite well, and so it’s even more dis­ap­point­ing than it would oth­er­wise be when it inevitably trails off. But for all of the mediocre parts of So Close to Life, there are a decent num­ber of sec­tions of gen­uine­ly immer­sive, inter­est­ing post-rock. And so, at the hum­ming sta­t­ic that is the finale to “Wait­ing for Noth­ing,” while it’s clear that Moon­lit Sailor hasn’t cre­at­ed a mas­ter­piece, it’s at least obvi­ous that some artis­tic vision went into the music.